Now MIT engineers have fabricated a functional dialysis membrane from a sheet of graphene—a single layer of carbon atoms, linked end to end in hexagonal configuration like that of chicken wire. The graphene membrane, about the size of a fingernail, is less than 1 nanometer thick. (The thinnest existing memranes are about 20 nanometers thick.) The team's membrane is able to filter out nanometer-sized molecules from aqueous solutions up to 10 times faster than state-of-the-art membranes, with the graphene itself being up to 100 times faster. 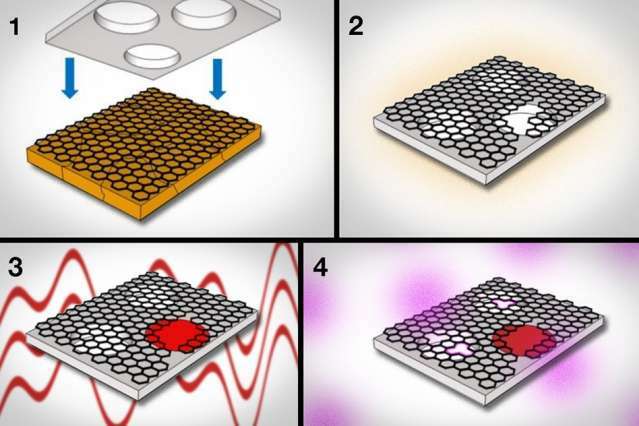 To make the graphene membrane even better, the team plans to improve the polycarbonate support by etching more pores into the material to increase the membrane's overall permeance. They are also working to further scale up the dimensions of the membrane, which currently measures 1 square centimeter. Further tuning the oxygen plasma process to create tailored pores will also improve a membrane's performance—something that Kidambi points out would have vastly different consequences for graphene in electronics applications. If they let the graphene partially curl up on itself and used that curled up tube as the membrane, they may be able to create a compact portable dialysis machine.